TAMPA, Fla. -- With the USF Sun Dome closed for renovations, family members and friends flocked to downtown Tampa for the University of South Florida College of Arts and Sciences undergraduate commencement on May 5. 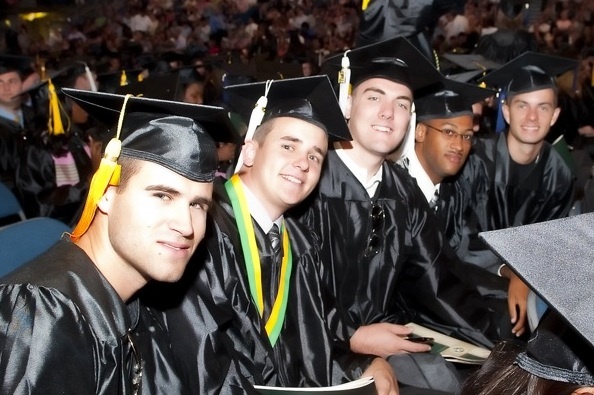 While the location for the graduation ceremony may have been different, the jubilation in the air was happily familiar as graduates headed instead to the St. Pete Times Forum. The traditional parts of the festivities stayed the same: from the graduates’ perspective -- line up in the right section beaming with pride; from the audience’s perspective -- listen for loved ones’ names to be called out by USF Honors College Dean Stuart Silverman and see them stride across the stage for a photo with USF President Judy Genshaft. Many stories could be found among the graduating class including the youngest graduate at 19, Crystal Tenn, who received a Bachelor of Science in Chemistry. Several CAS students were identified as an Undergraduate Scholar, including Michael Glidden who earned a 4.0 GPA in both of his physics and chemistry degrees. During Genshaft’s opening remarks, she mentioned biology major Ramzy Lotfi, the senior president of the USF American Red Cross Club. Under his leadership the organization became the largest USF organization on campus. Lotfi has exciting and challenging plans ahead. He will be leading a public health and literacy service trip to San Ignacio, Belize through USF’s Bulls Service Break Program. While there he and his team will be teaching Belizean first- through eighth-graders about diabetes, nutrition and hygiene. He also is going to take the Dental Admission Test in his pursuit of a career in dentistry.